It is no secret that fitness enthusiasts have been advised since ages to stay away from the temptation that is a scrumptious cake. This sweet delicacy has always been blamed by fitness conscious people for breaking their regime and creating a delicious distraction which keeps them at bay from achieving their fitness goals. 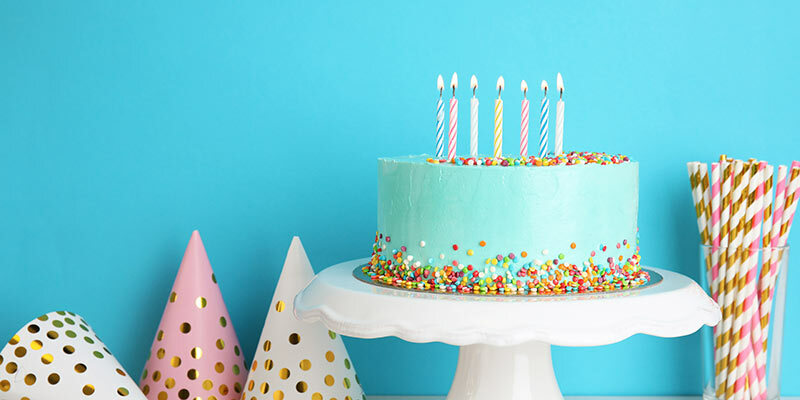 For all those gym goers, weight lifters, trainers and runners, we have some good news, you can have all the cake you want while maintaining your diet quotient intact. 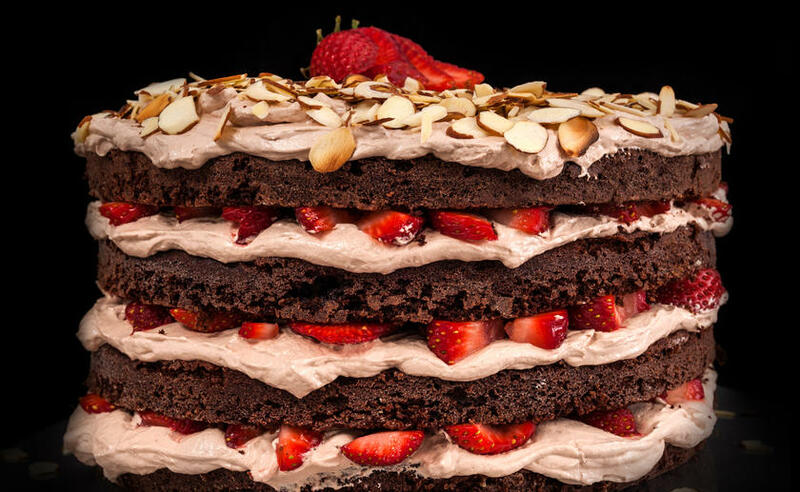 Life is no fun if you can’t grab an appetizing slice of cake. Here are a few to satiate your craving while you are working on those abs. Birthdays, anniversaries, Valentine’s Day, Christmas, New Year or just like that, it will hard for anyone to not love these freshly baked delicacies laden with fresh and healthy fruits. Have a look! 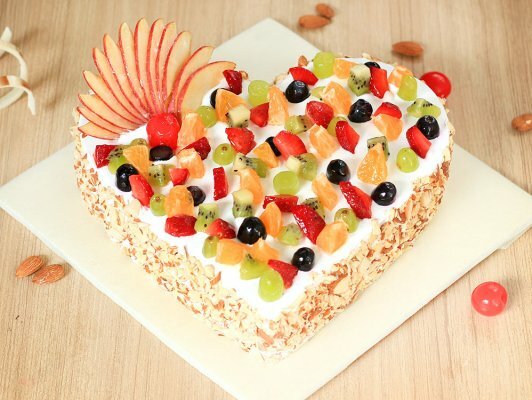 Adorned with freshly cut apples, oranges, and kiwis on the top, this heart-shaped cake will stop at nothing to fulfill your desire for a mouth-watering cake with the dash of health, making it irresistible. If your partner loves the gym as much as you, then this would make for a perfect birthday or anniversary cake. 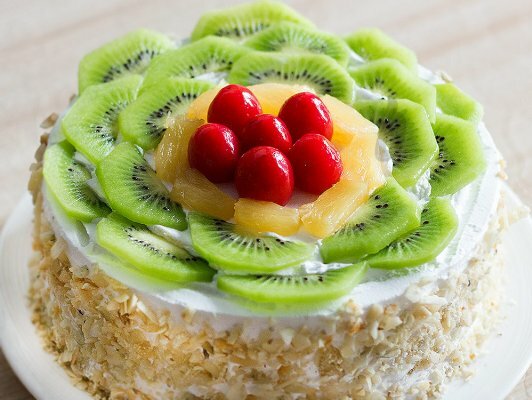 Kiwis are known to be brimming with Vitamin A, Vitamin C, Vitamin K, antioxidants and fiber and this flavorsome cake boast of being laden with it along with two toothsome layers of pineapples and cherries. This dessert tastes as exotic as it looks. Delve into this flavourful delight right away! It will be hard to keeping handoff of this wonderful fruit bonanza. 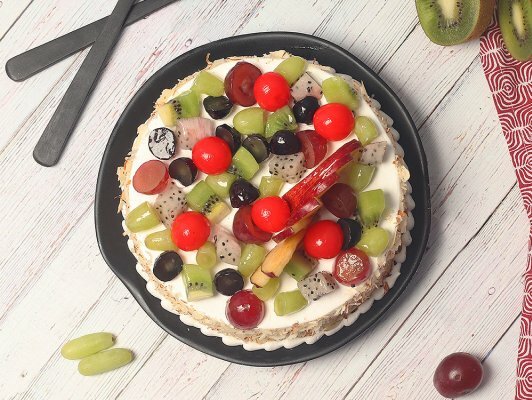 Baked with fresh Vanilla and whipped cream, this cake bears delicious tropical fruits, grapes, apples, cherries and then some more, in a stunning arrangement. It is a perfect way to celebrate any occasion and an enticing end to any meal. Fitness lovers, this one is for you! Once you taste it, you cannot stop thinking about it. 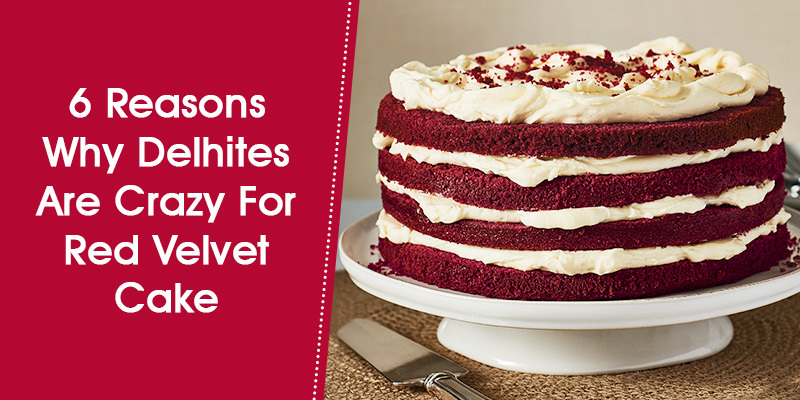 The red velvet is just out of your luxurious fantasies. Abundantly cream and open layered, this cake is adorned with loads of freshly cut tropical fruits which compliments its richness and smoothness perfectly. 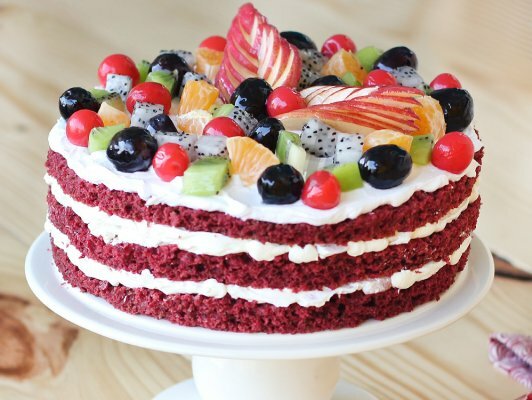 With this cake, carrying kiwis, cherries, apples, dragon fruits and black grapes, health and taste are not poles apart anymore. For chocolate lovers who wish to continue their fitness regime seamlessly! 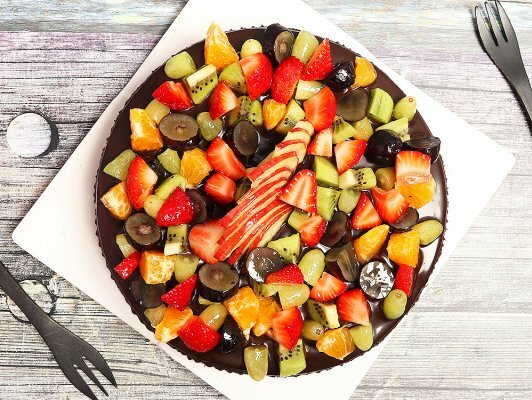 This rich chocolate truffle cake consists of layers of fresh fruits, apples, oranges, black grapes, cherries and kiwis, which lends it a healthy touch for all the fitness seekers out there. 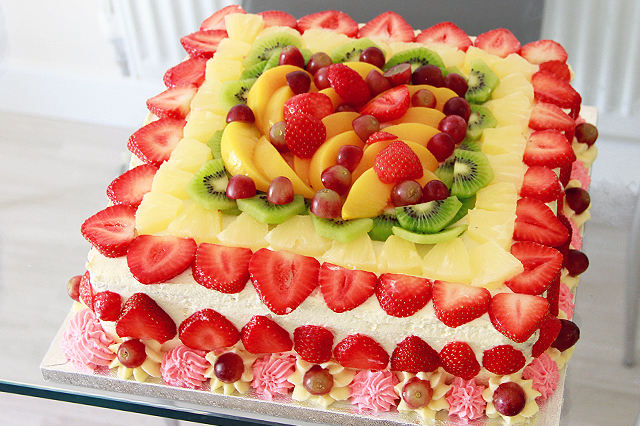 Fruits on the top and in-between the layers, it doesn’t get healthier than thou! 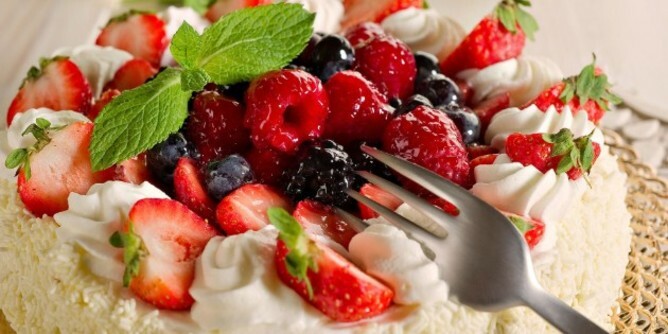 An ideal dessert for fruit lovers, this cake will steal their hearts with just its looks. Covered with grapes, pineapples, kiwi and seasonal fruits, this will be the center of attraction on any given celebration.